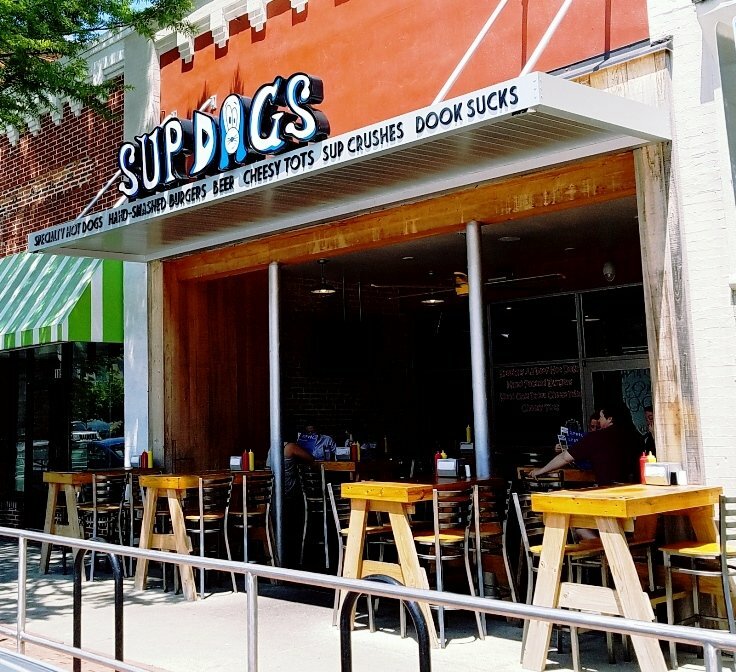 From the outside, the first thing you’ll notice about Sup Dogs is the patio. Under cover and shaded high-top tables with condiment dispensers on each one, it looks like a great spot to grab lunch and some fresh air. The Sup Dogs signage up above lists off the primary food items on the menu and one short and pointed message to the college down Tobacco Road in a darker shade of blue (a continuing theme). 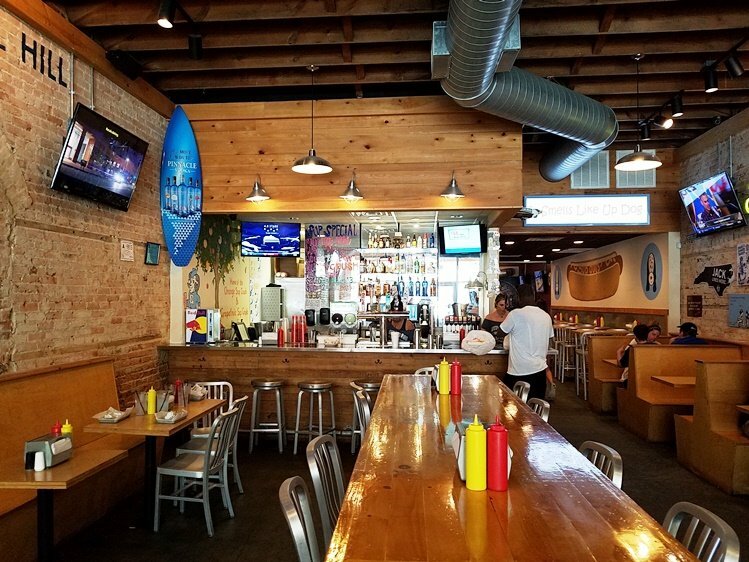 Inside Sup Dogs you’ll find a large open dining room decked out in brick, wood and a lot of Carolina blue signage. The young wait staff is clad in black and Carolina blue so you definitely know you’re in Chapel Hill! I grab a seat at the bar for lunch and take some time to dig deeper into the Sup Dogs menu. Thankfully, the menu here is pretty simple: burgers, chicken sandwich and the namesake Sup Dogs along with a litany of fried sides! Most of their dogs are in the $5.99 range with fries but you can upgrade to tots or cheese fries for an extra $1.00 or to bacon cheese fries or cheesy tots for $1.50. And if you add an extra dog, it’s only a $1.00. 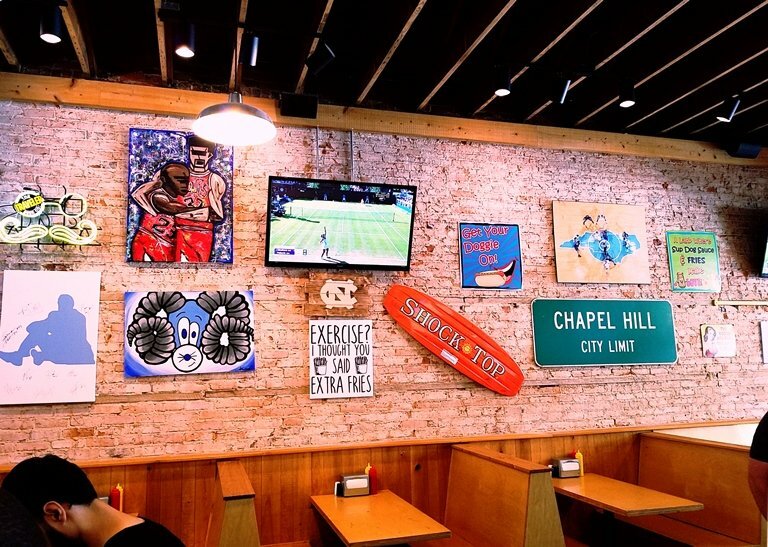 I’m doubling down for lunch with two dogs AND bacon cheese fries, gulp… As I’m waiting for my food, a table of Duke fans sit down for lunch and notice all the smack talk signage on the walls but thankfully they take it all in good fun and stay! 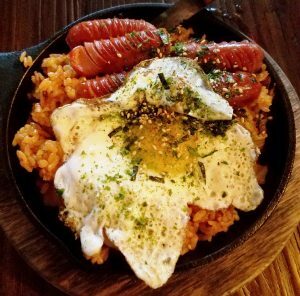 It takes 10 minutes or so for my food and wow, it’s a lot! 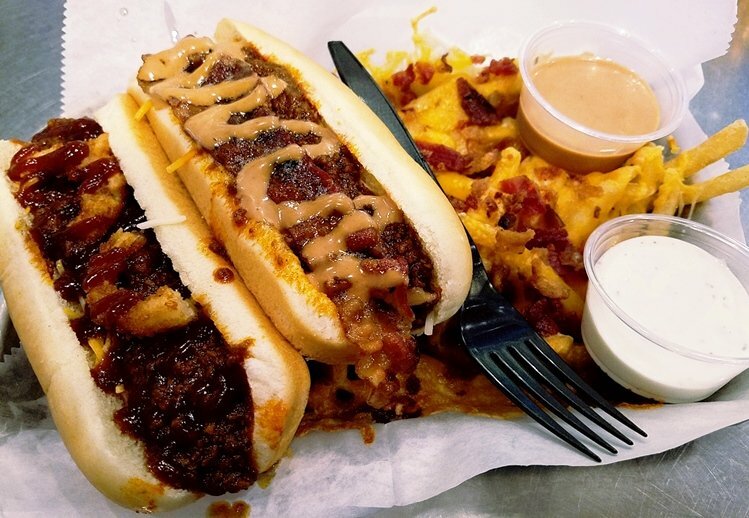 I’ve ordered up the Smokehouse and Western dogs which come sitting on top of a aluminum tray of by cheese fries! Sides of Sup sauce and ranch complete the meal. The Western dog (onion ring, BBQ sauce, Monterey Jack, cheddar cheese and chili) and the Smokehouse dog (bacon, Monterey Jack, cheddar cheese, Sup Dog sauce, and chili) come loaded with toppings. And they are good sized beef dogs which can stand up to all the toppings. And they’re both quite good, I like the creative options on the Sup Dogs menu. Digging in the bacon cheese fries feels like another 1,000 calories but I can’t resist! The fries have a bit of skin and great potato taste. The cheese and bacon bits are generously coated on the pile of fries, too. And the Sup Sauce is great, probably a tangy, savory Thousand Island mix that is great for dipping. All in all it’s a filling meal with plenty of salt, grease and deliciousness! The staff here is pretty young, probably from the UNC student body but do a good job keeping my drink cup filled and check in on me regularly. 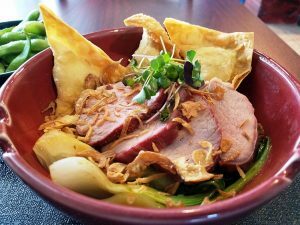 And while I don’t think you should be eating here regularly due to health reasons, it’s definitely a fun lunch stop and would probably be even better after a few beers on Franklin Street. 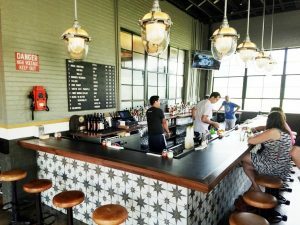 If you’re interested in hot dogs, I definitely believe that Sup Dogs is a great choice in the Triangle for its variety and value in this category. If I lived in the area, I’d definitely be back from time to time. And I’m glad I finally know, what’s up dog!